This Blog chronicles my current radio developments. MRF7S242500 amplifier, sometimes things don't go as planned! There has been some interest in the 2.4 GHz PA I built for QO100. very well, this turned out to be due to inadequate grounding. After a re-build I got closer to the expected results. 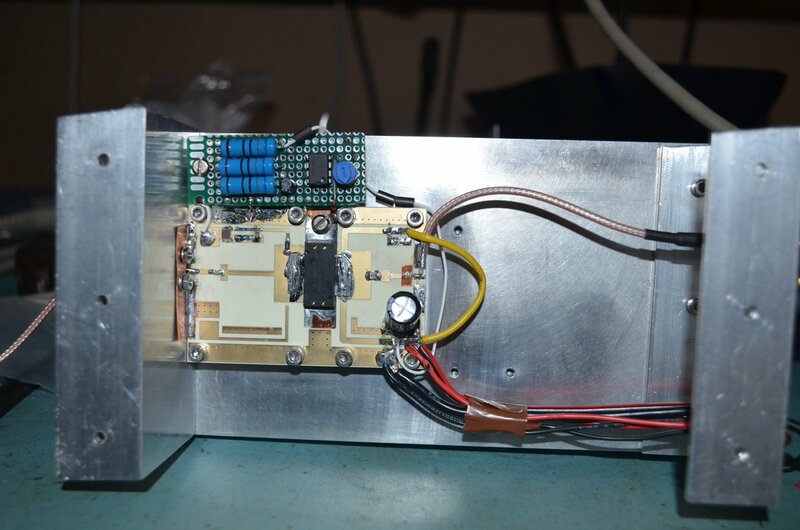 130 watts CW output well below the device limit of 250 watts. I have also had to modify the output match slightly to get that amount. no where near meets the specification. adding extra decoupling to the bias supply and moving some wires about. The output coax is temporary as I don't have anything suitable in stock. Originally I had a 200 watt circulator in the amplifier. I removed the circulator to see if that was the problem. It wasn't. and worked first time and to spec. only requires a few milliwatts and another than requires about 4 watts drive. Currently only the 4 watt version BPC2425M9X250Z is available from stock.